In 1772, Moravian missionaries founded a mission for American Indians in the Ohio Country at Schoenbrunn ("Beautiful Spring" in German). Because of its success, Rev. David Zeisberger founded a second village in the same year at Gnadenhutten ("Tents of Grace" in German). Life at Gnadenhutten was similar to life at Schoenbrunn. The American Revolution made life difficult for the residents of Gnadenhutten and other Moravian settlements. During the war, the non-Christian Delaware increasingly supported England instead of the rebellious Americans or the Christian Delaware, who hoped to remain neutral. To protect his followers, Zeisberger consolidated the Moravian missions at Lichtenau in 1778, but he eventually reestablished the village of Gnadenhutten in April 1779. In 1781, British authorities ordered the Christian Delaware to abandon their current villages and relocate in northern Ohio along the Sandusky River. Arriving at their new villages in the late fall, too late to plant crops, the Moravians and the Christian Delaware faced serious food shortages during the winter of 1781-1782. Hoping to alleviate their suffering, Zeisberger sent a group back to Gnadenhutten in March 1782, to harvest whatever crops remained in the fields. Mistakenly believing that these peaceful American Indians were responsible for recent raids in nearby Pennsylvania, militiamen attacked the village, captured the inhabitants, and then brutally murdered them. 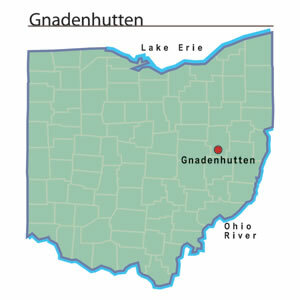 This gruesome event is known as the Gnadenhutten Massacre. After the incident, the Moravians never rebuilt the village.